During development, ContiTech Beattie identified that product testing was not a practical or an economic proposition. Wilde used FEA to check their equipment would perform its duty safely under the most arduous of conditions and obtain approval by Lloyd’s Register. ContiTech Beattie, based in Northumberland, is a major service provider to the offshore oil and gas sector. Amongst their product / service offering they produce mounted offloading reels for the use on FPSO vessels. An FPSO is a floating tank system designed to receive the retrieved oil or gas produced from nearby platforms and to process and store it until offloading can take place onto a tanker or transported through a pipeline. ContiTech Beattie delivers flexible engineering excellence specialising in rubber and plastics technology and is the world’s largest manufacturer of non-tyre rubber-based products. As a worldwide supplier, they develop, produce and deal with all aspects of fluid handling technology and are represented in more than 140 countries by subsidiaries, regional sales offices and joint venture partners. During new product development, ContiTech Beattie identified that detailed FEA (Finite Element Analysis) was required to demonstrate that their equipment would perform its duty safely under the most arduous of conditions. It was also identified that product testing was not a practical or an economic proposition. The analysis was required for approval by Lloyds Register. As a mounted offloading reel is a large offshore structure critical to the efficient and safe transfer of oil or gas from one vessel to another at sea, the required analysis was to take into consideration all anticipated operating and emergency loading conditions. Global and localised stress distributions were required in addition to displacement predictions. Assessment of the acceptability of all significant structural components was also part of the scope of work and the analysis had to prove the structure for lift handling cases. “We approached Wilde because of their experience working with the offshore sector using FEA. The project was one where we had to ensure the offloading reel was ‘fit for purpose’ in what would be very demanding conditions and were confident Wilde would provide us with the detailed and accurate analysis needed”. 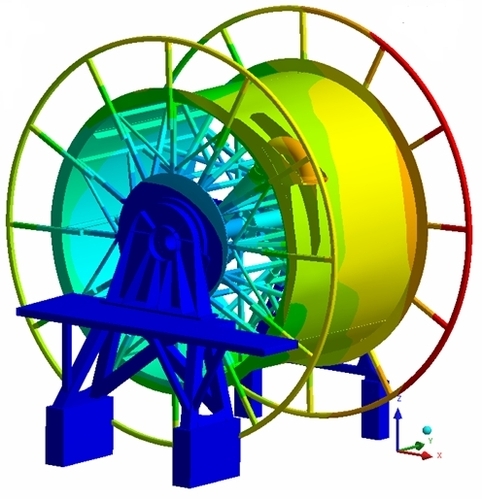 ContiTech Beattie supplied Wilde Analysis with 3D solid CAD geometry as the basis of the finite element model, which was imported into the leading ANSYS simulation software used extensively within the offshore industry. Much of the offloading reel structure was thin walled when compared to the main dimensions, and therefore benefited from the use of shell elements to accurately and efficiently capture any bending behaviour. Consequently, thin sections of the solid geometry were mid-surfaced where appropriate with the aid of the ANSYS DesignModeler geometry editing module, with remaining parts meshed with solid elements. Various analysis runs were performed to simulate the effect of ship born wave motions and equipment deployment loads. Finally a technical report was supplied to the client to support the findings of the design. 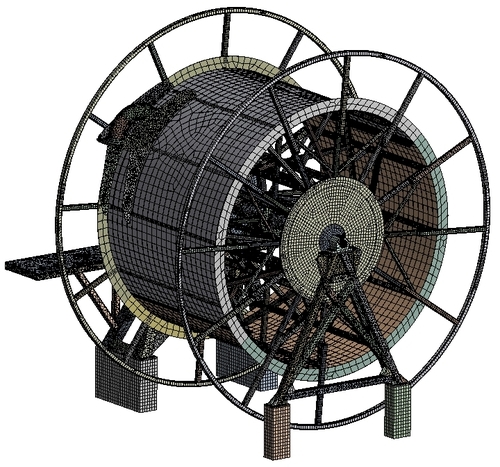 Structural Analysis of New Offloading Reel Design for FPSO Vessels Courtesy: ContiTech Beattie Ltd.